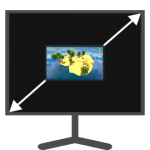 Editor Window Fullscreen is an editor extension for the Unity Editor which allows any editor window, including the in-editor game view, to be opened instantly in fullscreen mode, on any screen. Great for quick-testing the game in a realistic resolution, and maximizing the use of your screen space with your favourite Unity editor windows. Now with support for Mac OS, Unity 2018, Project browser, Timeline window, Playmaker window, and all-new options. Option to auto-enter fullscreen on play, and exit fullscreen on game stop (and vice-versa). Supports Windows 10 and Mac (macOS). Improved support for fullscreening Timeline and Playmaker windows (using F9). Easily customizable hotkeys and settings, via a GUI settings window (shortcut Ctrl+Shift+F8). Multi-display support. Each window type can be opened in fullscreen on one or more screens. Supports per-monitor display scaling (hi-DPI). Retains the Scene View state (lighting, world position etc.) when opening the Scene View in fullscreen. Exits existing fullscreens on the same screen when opening a new one. Ability to fullscreen the main Unity window. It returns to its original size when exiting fullscreen mode. Cursor lock is retained when entering fullscreen game view. Reloads previous fullscreen state when restarting Unity. Ability to toggle the top toolbar for the game view, scene view, and main view when in fullscreen mode. By default, fullscreen windows open at the current mouse position. This is adjustable in settings. When toggling fullscreen, a new fullscreen window is created if none of that type exists at the desired position. If one already exists at that position, it is closed. No special installation is required for fullscreen functionality. Once you’ve imported this package into your project, all of the fullscreen hotkeys should work out-of-the-box. Open the Asset Store window inside Unity by navigating to Window >> General >> Asset Store. Click the “My Assets” icon or search for “Editor Window Fullscreen”. Click the “Download” button next to Editor Window Fullscreen. Once the download is complete, click “Import”, and then “Import” again. You’re done! The asset is now installed. If you want to play the demo — an optional and brief 2D tutorial on how to use this extension, please follow the instructions contained in the Readme.txt included with the package, or watch the tutorial video. There is a menu-item for every fullscreen hotkey, located in the menu bar under the “Window” >> “Editor Window Fullscreen” menu. Settings and hotkeys can be changed in the graphical “Fullscreen Window Settings” window. You can access this through the Edit menu, by going to “Edit >> Fullscreen Window Settings…”. Alternatively you can use the hotkey Ctrl+Shift+F8 to immediately open the settings window. The hotkeys for creating and closing fullscreen editor windows. position, or a custom position). This determines which screen the fullscreen window will open on. Whether to show the top toolbar by default, when entering fullscreen mode. (Only applies to Scene View, Game View, and Main Window, which have top toolbars). The hotkey for showing/hiding the top toolbar, if one exists, when in fullscreen mode. The hotkey for closing all fullscreen windows. Options to link game start and stop events to exiting and entering of a fullscreen game window. Whether to show a notification on fullscreen entry. Source code is included (excl. Mac system libaries), along with code usage information in the Readme. Bug reports or suggestions are welcome! For support, email support@crystalconflux.com, or post in the forum thread.